John Ogilby - The Road from London to Weymouth. This antique strip map is from the "Britannia" by John Ogilby, first published in 1675 with later hand colouring . This map is one of 100 maps in the atlas and is entitled " The Road from London to Weymouth." From Basingstoke to Sutton to Stockbridge to Broughton to Dunketon to Cramborn to Blandford to Dorchester to Weymouth. This antique strip map is from the "Britannia" by John Ogilby, first published in 1675 with later hand colouring . This map is Number 21 of 100 maps in the atlas and is entitled " The Road from London to Holyhead co. Anglesey." From London to Highgate to High Barnet, St.Albans, Dunstable, Little Brickhill, Stony Stratford and Towcester. Clean map with good margins. In the in the title cartouche a surveyor uses a 'waywiser', the measuring tool used by Ogilby's men for the survey of the roads. John Ogilby - The Road fromExeter to Truroe in com Corn. This antique strip map is from the "Britannia" by John Ogilby, first published in 1675 with later hand colouring . This map is Number 69 of 100 maps in the atlas and is entitled " The Road fromExeter to Truroe in com Corn. " From Exeter to Dunfford to Chegford to Tavistoke to Liscard to Lithithiel to Grampond to Truroe. Clean map with good margins. John Ogilby - The Road from London to Portsmouth in com Southamp. This antique strip map is from the "Britannia" by John Ogilby, first published in 1675 with later hand colouring . This map is Number 30 of 100 maps in the atlas and is entitled " The Road from London to Portsmouth in com Southamp." From Cornhill, London to Wansworth, to Kingstone, to Cobham, to Guildford, to Godalmin, to Lippock, to Petersfield, to Harnden, to Portsey Bridge, the to Portsmouth. Clean map with good margins. John Ogilby - The Road from London to Norwich in Norfolk. This antique strip map is from the "Britannia" by John Ogilby, first published in 1675 with later hand colouring . This map is Number 46 of 100 maps in the atlas and is entitled " The Road from London to Norwich in Norfolk." From Puckeridge to Barkway to Wittlesford to Newmarket to Berton Mills to Thetford to Larlingford to Attleborough to Windham to the City of Norwich. Clean map with some restoration to bottom margin. John Ogilby - The Continuation of the Road from London to the Lands End. This antique strip map is from the "Britannia" by John Ogilby, first published in 1675 with later hand colouring and is map number 28 of 100 maps in the atlas. It is entitled "The Continuation of the Road from London to the Lands End. Commencing at Plimouth to Lowe, Foye, Trewardreth, Tregoney, Phily, Market Jre, Penzance, St.Burion to Senan. Clean map with margins as shown. John Ogilby - The Road from Ferrybridge to Boroughbridge continued to Barnard Castle. More Info This antique strip map is from the "Britannia" by John Ogilby, first published in 1675 with later hand colouring and is map number 95 of 100 maps in the atlas. It is entitled "The Road from Ferrybridge to Boroughbridge continued to Barnard Castle. Commencing at Ferrybridge to Abbeyforth to Wetherby to Boroughbridge to Rippon to Lemyng to Richmond and to Barnard Castle. Clean map with good margins. This antique strip map is from the "Britannia" by John Ogilby, first published in 1675 with later hand colouring and is map number 95 of 100 maps in the atlas. It is entitled "The Road from Ferrybridge to Boroughbridge continued to Barnard Castle. Commencing at Ferrybridge to Abbeyforth to Wetherby to Boroughbridge to Rippon to Lemyng to Richmond and to Barnard Castle. Clean map with good margins. John Ogilby - The Road from Glocester to Montgomery. More Info This antique strip map is from the "Britannia" by John Ogilby, first published in 1675 with later hand colouring . This map is Number 71 of 100 maps in the atlas and is entitled " The Road from Glocester to Montgomery." From Glocester to Huntley to Ross to Michbirch to Hereford to Pembridge to Presteine to Knighton to Clunn to Montgomery. Clean map, the lower half of both vertical margins have been strengthened on verso. This antique strip map is from the "Britannia" by John Ogilby, first published in 1675 with later hand colouring . This map is Number 71 of 100 maps in the atlas and is entitled " The Road from Glocester to Montgomery." From Glocester to Huntley to Ross to Michbirch to Hereford to Pembridge to Presteine to Knighton to Clunn to Montgomery. Clean map, the lower half of both vertical margins have been strengthened on verso. John Ogilby - The Continuation of the Road from London to St. Davids. More Info This antique strip map is from the "Britannia" by John Ogilby, first published in 1675 with later hand colouring . This map is one of 100 maps in the atlas and is entitled " The Continuation of the Road from London to St. Davids commencing at Abingdon and extending to Monmouth" From Abingdon to Faringdon to Lechlade to Fairwood to Barnsley to Glocester to Monmouth. This antique strip map is from the "Britannia" by John Ogilby, first published in 1675 with later hand colouring . This map is one of 100 maps in the atlas and is entitled " The Continuation of the Road from London to St. Davids commencing at Abingdon and extending to Monmouth" From Abingdon to Faringdon to Lechlade to Fairwood to Barnsley to Glocester to Monmouth. John Ogilby - The Continuation of the Road from London to Barwick beginning at Tuxford & Extending to York. More Info This antique strip map is from the "Britannia" by John Ogilby, first published in 1675 with later hand colouring. This map is Number 7 of 100 maps in the atlas and is entitled "The Continuation of the Road from London to Barwick beginning at Tuxford & Extending to York." FromTuxford to Bawtree to Doncaster to Wentbridge to Tadcaster to York. Good margins and in nice condition. This antique strip map is from the "Britannia" by John Ogilby, first published in 1675 with later hand colouring. This map is Number 7 of 100 maps in the atlas and is entitled "The Continuation of the Road from London to Barwick beginning at Tuxford & Extending to York." FromTuxford to Bawtree to Doncaster to Wentbridge to Tadcaster to York. Good margins and in nice condition. John Ogilby - The Road from London to the Lands End. More Info This antique strip map is from the "Britannia" by John Ogilby, first published in 1675 with later hand colouring. This map is Number 25 of 100 maps in the atlas and is entitled " The Road from London to the Lands End." From London to Brantfort to Stanes to Bagshot to Hartley Row to Basingstoke to Andover to Salisbury to Shaftesbury to Sherborn to Crookhorn to Axminster to Honiton to Exeter to Chidley to Ashburton to Brent to Plymouth to Lowe to Trewardreth to Tregoney to Market Jew to Penzance to Senan. Left margin trimmed as shown. This antique strip map is from the "Britannia" by John Ogilby, first published in 1675 with later hand colouring. This map is Number 25 of 100 maps in the atlas and is entitled " The Road from London to the Lands End." From London to Brantfort to Stanes to Bagshot to Hartley Row to Basingstoke to Andover to Salisbury to Shaftesbury to Sherborn to Crookhorn to Axminster to Honiton to Exeter to Chidley to Ashburton to Brent to Plymouth to Lowe to Trewardreth to Tregoney to Market Jew to Penzance to Senan. Left margin trimmed as shown. John Ogilby - The Roads from Chelmsford in Essex to St. Edmonds-Bury in Suffolk and Saffron-Waldon in Essex. More Info This antique strip map is from the "Britannia" by John Ogilby, first published in 1675 with later hand colouring and is map number 92 of 100 maps in the atlas. It is entitled "The Roads from Chelmsford in Essex to St. Edmonds-Bury in Suffolk and Saffron-Waldon in Essex. Commencing at Chelmsford to Braintree to Sudbury to Laneham and to St. Edmond's Bury. Also from Chelmsford to Dunmow to Thaxted to Saffron Walden. This antique strip map is from the "Britannia" by John Ogilby, first published in 1675 with later hand colouring and is map number 92 of 100 maps in the atlas. It is entitled "The Roads from Chelmsford in Essex to St. Edmonds-Bury in Suffolk and Saffron-Waldon in Essex. Commencing at Chelmsford to Braintree to Sudbury to Laneham and to St. Edmond's Bury. Also from Chelmsford to Dunmow to Thaxted to Saffron Walden. John Ogilby - The Continuation of the Road from York to West Chester. More Info This antique strip map is from the "Britannia" by John Ogilby, first published in 1675 with later hand colouring. From Warrington to Frodsham to Chester. The second from Manchester to Stockport to Dysley Deyn to Buxton to Lathkel to Brassington to Weston Underwood to Derby. This antique strip map is from the "Britannia" by John Ogilby, first published in 1675 with later hand colouring. From Warrington to Frodsham to Chester. The second from Manchester to Stockport to Dysley Deyn to Buxton to Lathkel to Brassington to Weston Underwood to Derby. John Ogilby - The Road from London to Buckingham. More Info This antique strip map is from the "Britannia" by John Ogilby, first published in 1675 with later hand colouring. This map is Number 12 of 100 maps in the atlas and is entitled " The Road from London to Buckingham." From London to Acton to Uxbridge to Amersham to Wendover to Alesbury to East Clayton to Buckingham to Shrouton to Banbury then continuing to Bridgenorth. This antique strip map is from the "Britannia" by John Ogilby, first published in 1675 with later hand colouring. 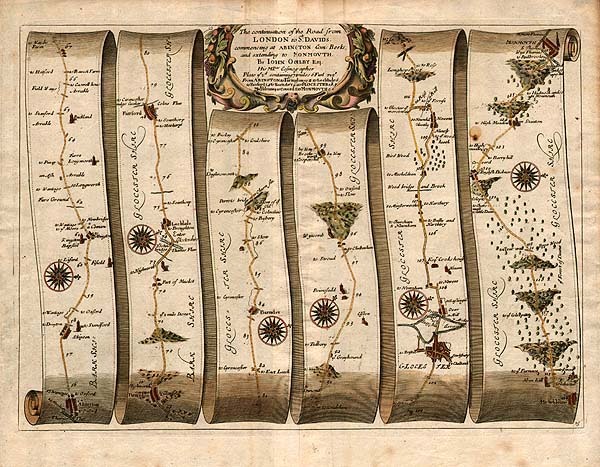 This map is Number 12 of 100 maps in the atlas and is entitled " The Road from London to Buckingham." From London to Acton to Uxbridge to Amersham to Wendover to Alesbury to East Clayton to Buckingham to Shrouton to Banbury then continuing to Bridgenorth. John Ogilby - The Road from Oxford to Chichester. More Info This antique strip map is from the "Britannia" by John Ogilby, first published in 1675 with later hand colouring . This map is Number 81 of 100 maps in the atlas and is entitled " The Road from Oxford to Chichester." From Oxford to Abington to East Ilsley to Newbury to King's Cleer to Basingstoke to Alton to Petersfield to the City of Chichester. This antique strip map is from the "Britannia" by John Ogilby, first published in 1675 with later hand colouring . This map is Number 81 of 100 maps in the atlas and is entitled " The Road from Oxford to Chichester." From Oxford to Abington to East Ilsley to Newbury to King's Cleer to Basingstoke to Alton to Petersfield to the City of Chichester. John Ogilby - The Road from Bristol to Weymouth. More Info This antique strip map is from the "Britannia" by John Ogilby, first published in 1675 with later hand colouring . This map is Number 60 of 100 maps in the atlas and is entitled " The Road from Bristol to Weymouth." From Bristol to Bishop's Chue to Wells to Glastonbury to Somerton to Martock to Crokehorn to South Parret to Frampton to Weymouth. Overall yellowing and margins strengthened on verso with archival tape. Centrefold also strengthened on verso. This antique strip map is from the "Britannia" by John Ogilby, first published in 1675 with later hand colouring . This map is Number 60 of 100 maps in the atlas and is entitled " The Road from Bristol to Weymouth." From Bristol to Bishop's Chue to Wells to Glastonbury to Somerton to Martock to Crokehorn to South Parret to Frampton to Weymouth. Overall yellowing and margins strengthened on verso with archival tape. Centrefold also strengthened on verso. More Info This antique strip map is from the "Britannia" by John Ogilby, first published in 1675 with later hand colouring . This map is Number 68 of 100 maps in the atlas and is entitled " The Continuation of the Road from London to Holyhead." From Lichfield to Rugeley to Great Haywood to Stone to Stableford Bridge to Wore to Namtwich to Torperley to Chester. Clean map with good margins. Laid on paper. This antique strip map is from the "Britannia" by John Ogilby, first published in 1675 with later hand colouring . This map is Number 68 of 100 maps in the atlas and is entitled " The Continuation of the Road from London to Holyhead." From Lichfield to Rugeley to Great Haywood to Stone to Stableford Bridge to Wore to Namtwich to Torperley to Chester. Clean map with good margins. Laid on paper. John Ogilby - The Road from Exeter to Barnstable & Thence to Ilfracombe co. Devon. More Info This antique strip map is from the "Britannia" by John Ogilby, first published in 1675 with later hand colouring . This map is Number 68 of 100 maps in the atlas and is entitled "The Road from Exeter to Barnstable & Thence to Ilfracombe co. Devon." From Exeter to Crediton to Chimleigh to Barnstable to Ilfracombe and continued to Bediford to Torington to co. Devon. Clean map with good margins. This antique strip map is from the "Britannia" by John Ogilby, first published in 1675 with later hand colouring . This map is Number 68 of 100 maps in the atlas and is entitled "The Road from Exeter to Barnstable & Thence to Ilfracombe co. Devon." From Exeter to Crediton to Chimleigh to Barnstable to Ilfracombe and continued to Bediford to Torington to co. Devon. Clean map with good margins. John Ogilby - The Road from Glocester to Coventrey. More Info This antique strip map is from the "Britannia" by John Ogilby, first published in 1675 with later hand colouring . This is plate number 70. It is entitled "The Road from Glocester to Coventrey." Commencing at Glocester to Cheltenham to Winchcomb to Campden to Stratford to Warwick to Coventry. Very clean map with wide margins . 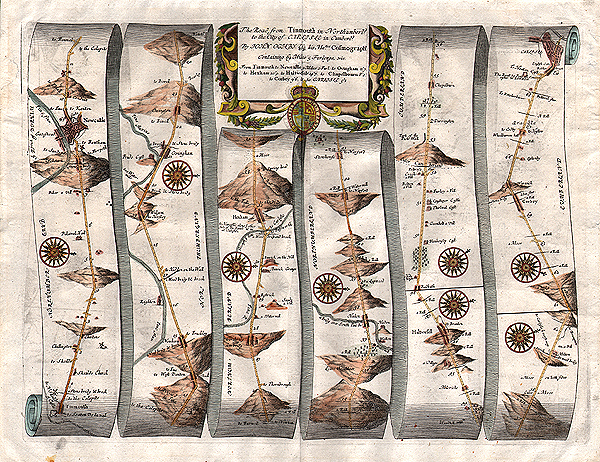 This antique strip map is from the "Britannia" by John Ogilby, first published in 1675 with later hand colouring . This is plate number 70. It is entitled "The Road from Glocester to Coventrey." Commencing at Glocester to Cheltenham to Winchcomb to Campden to Stratford to Warwick to Coventry. Very clean map with wide margins . More Info This antique strip map is from the "Britannia" by John Ogilby, first published in 1675 with later hand colouring. There are 100 maps in the atlas and is entitled " The Road from London to Barwick." From London to Waltham to Ware to Royston to Huntingdon to Stilton. Fine condition. This antique strip map is from the "Britannia" by John Ogilby, first published in 1675 with later hand colouring. There are 100 maps in the atlas and is entitled " The Road from London to Barwick." From London to Waltham to Ware to Royston to Huntingdon to Stilton. Fine condition. John Ogilby - The Roads from Exeter com Devon to Dorchester and from Plimouth to Dartmouth com Devon. More Info This antique strip map is from the "Britannia" by John Ogilby, first published in 1675 with later hand colouring . This map is Number 94 of 100 maps in the atlas and is entitled "The Roads from Exeter com Devon to Dorchester and from Plimouth to Dartmouth com Devon." From Exeter to Bishops Clyst to Newton-Popler to Cullyford to Lime to Chidiok to Bridport and to Dorchester. The second from Plimouth to Modbury to Holwell to Dartmouth. A very clean example. This antique strip map is from the "Britannia" by John Ogilby, first published in 1675 with later hand colouring . This map is Number 94 of 100 maps in the atlas and is entitled "The Roads from Exeter com Devon to Dorchester and from Plimouth to Dartmouth com Devon." From Exeter to Bishops Clyst to Newton-Popler to Cullyford to Lime to Chidiok to Bridport and to Dorchester. The second from Plimouth to Modbury to Holwell to Dartmouth. A very clean example. John Ogilby - The Road from London to Southampton. More Info This antique strip map is from the "Britannia" by John Ogilby, first published in 1675 with later hand colouring. This map is Number 52 of 100 maps in the atlas and is entitled " The Road from London to Southampton." From Bagshot to Farnham to Alton to Alersford to Southampton to Rumsey to White Parish to Salisbury. This antique strip map is from the "Britannia" by John Ogilby, first published in 1675 with later hand colouring. This map is Number 52 of 100 maps in the atlas and is entitled " The Road from London to Southampton." From Bagshot to Farnham to Alton to Alersford to Southampton to Rumsey to White Parish to Salisbury. John Ogilby - The Road from Cambridge to Coventry. More Info This antique strip map is from the "Britannia" by John Ogilby, first published in 1675 with later hand colouring. This map is Number 62 of 100 maps in the atlas and is entitled " The Road from Cambridge to Coventry." From Cambridge to Elsley to St. Neots to Great Stroughtonto Higham Ferries to Northampton to Watford to Rugby to the City of Coventry. This antique strip map is from the "Britannia" by John Ogilby, first published in 1675 with later hand colouring. This map is Number 62 of 100 maps in the atlas and is entitled " The Road from Cambridge to Coventry." From Cambridge to Elsley to St. Neots to Great Stroughtonto Higham Ferries to Northampton to Watford to Rugby to the City of Coventry. More Info This antique strip map is from the "Britannia" by John Ogilby, first published in 1675 with later hand colouring. This map is Number 90 of 100 maps in the atlas and is entitled " The Continuation of the Road From York to West Chester"
From Warrington to to the City of Chester, compleated by the Branch from Manchester to Stockport to Disley Deyn to Buxton to Lathkel to Brassington to Weston Underwood to Derby. This antique strip map is from the "Britannia" by John Ogilby, first published in 1675 with later hand colouring. This map is Number 90 of 100 maps in the atlas and is entitled " The Continuation of the Road From York to West Chester"
More Info This antique strip map is from the "Britannia" by John Ogilby, first published in 1675 with later hand colouring and is map number 95 of 100 maps in the atlas. It is entitled "The Road from Ferrybridge to Boroughbridge continued to Barnard Castle. Commencing at Ferrybridge to Abbeyforth to Wetherby to Boroughbridge to Rippon to Lemyng to Richmond and to Barnard Castle. Stain in right margin. This antique strip map is from the "Britannia" by John Ogilby, first published in 1675 with later hand colouring and is map number 95 of 100 maps in the atlas. It is entitled "The Road from Ferrybridge to Boroughbridge continued to Barnard Castle. Commencing at Ferrybridge to Abbeyforth to Wetherby to Boroughbridge to Rippon to Lemyng to Richmond and to Barnard Castle. Stain in right margin. John Ogilby - The Road from Bristol to Worcester. More Info This antique strip map is from the "Britannia" by John Ogilby, first published in 1675 with later hand colouring . This map is Number 59 of 100 maps in the atlas and is entitled "The Road from Bristol to Worcester." From Bristol to Acton to Dursley to Whitmister to Glocester to Tewkesbury to Severnstoake to Worcester. Fine condition and very clean. This antique strip map is from the "Britannia" by John Ogilby, first published in 1675 with later hand colouring . This map is Number 59 of 100 maps in the atlas and is entitled "The Road from Bristol to Worcester." From Bristol to Acton to Dursley to Whitmister to Glocester to Tewkesbury to Severnstoake to Worcester. Fine condition and very clean. John Ogilby - The Continuation of the Road from Chester to Cardiff com Glamorgan. More Info This antique strip map is from the "Britannia" by John Ogilby, first published in 1675 with later hand colouring . This map is Number 64 of 100 maps in the atlas and is entitled "The Continuation of the Road from Chester to Cardiff com Glamorgan. " From Llanbader Vunneth to Llanbeder Vaur to Bealt to Brecknock to Pont Stucketh enter Glamorgan to Cardiff. Fine condition and very clean. This antique strip map is from the "Britannia" by John Ogilby, first published in 1675 with later hand colouring . This map is Number 64 of 100 maps in the atlas and is entitled "The Continuation of the Road from Chester to Cardiff com Glamorgan. " From Llanbader Vunneth to Llanbeder Vaur to Bealt to Brecknock to Pont Stucketh enter Glamorgan to Cardiff. Fine condition and very clean. John Ogilby - The Road from London to Hithe, Kent. More Info This antique strip map is from the "Britannia" by John Ogilby, first published in 1675 with later hand colouring . This is plate number 20. It is entitled "The Road from London to Hithe in Com Kent". Commencing at London to Eltham to Farmingham to Croseley to Aylisford to Barsted to Ashford to Hith. Wide margins and nice condition. This antique strip map is from the "Britannia" by John Ogilby, first published in 1675 with later hand colouring . This is plate number 20. It is entitled "The Road from London to Hithe in Com Kent". Commencing at London to Eltham to Farmingham to Croseley to Aylisford to Barsted to Ashford to Hith. Wide margins and nice condition. John Ogilby - The Road from Tinmouth in Northumberland to the City of Carlisle in Cumberland. More Info This antique strip map is from the "Britannia" by John Ogilby, first published in 1675 with later hand colouring . It is entitled "The Road from Tinmouth in Northumberland to the City of Carlisle in Cumberland." Commencing at Tinmouth to Newcastle to Ovingham to Hexham to Haltwesell to Chapelbourn to Corbey to Carlisle. Clean map with good margins. This antique strip map is from the "Britannia" by John Ogilby, first published in 1675 with later hand colouring . It is entitled "The Road from Tinmouth in Northumberland to the City of Carlisle in Cumberland." Commencing at Tinmouth to Newcastle to Ovingham to Hexham to Haltwesell to Chapelbourn to Corbey to Carlisle. Clean map with good margins. John Ogilby - The Continuation of the Road from London to Barwick. More Info This antique strip map is from the "Britannia" by John Ogilby, first published in 1675 with later hand colouring . This map is Number 7 of 100 maps in the atlas and is entitled " The Continuation of the Road from London to Barwick"
From Stilton to Stamford to Grantham to Newark to Tuxford. This antique strip map is from the "Britannia" by John Ogilby, first published in 1675 with later hand colouring . This map is Number 7 of 100 maps in the atlas and is entitled " The Continuation of the Road from London to Barwick"
John Ogilby - The Road from London to Harwich in Essex. More Info This antique strip map is from the "Britannia" by John Ogilby, first published in 1675 with later hand colouring . This map is Number 19 of 100 maps in the atlas and is entitledentitled "The Road from London to Harwich in Essex." Commencing at London to Rumford to Burntwood to Chelmsford to Witham to eldon to Colchester to Maningtree to Harwich. This antique strip map is from the "Britannia" by John Ogilby, first published in 1675 with later hand colouring . This map is Number 19 of 100 maps in the atlas and is entitledentitled "The Road from London to Harwich in Essex." Commencing at London to Rumford to Burntwood to Chelmsford to Witham to eldon to Colchester to Maningtree to Harwich. John Ogilby - The Road from London to Barnstable. More Info This antique strip map is from the "Britannia" by John Ogilby, first published in 1675 with later hand colouring . This map is Number 37 of 100 maps in the atlas and is entitled "The Road from London to Barnstable in Devonshire" Commencing at Andover to Amesbury to Shruton to Warminster to Maiden Bradley to Bruton to Weston Regis to Ascot to Bridgewater. This antique strip map is from the "Britannia" by John Ogilby, first published in 1675 with later hand colouring . This map is Number 37 of 100 maps in the atlas and is entitled "The Road from London to Barnstable in Devonshire" Commencing at Andover to Amesbury to Shruton to Warminster to Maiden Bradley to Bruton to Weston Regis to Ascot to Bridgewater. John Ogilby - The Road from London to Carlisle. More Info This antique strip map is from the "Britannia" by John Ogilby, first published in 1675 with later hand colouring . This map is Number 37 of 100 maps in the atlas and is entitled " The Road from London to Carlisle." From Darleston to Newcastle to Brewerton to Grutam to Warrington to Newton to Wigan to Whittle to Preston to Garstang to Carlisle. This antique strip map is from the "Britannia" by John Ogilby, first published in 1675 with later hand colouring . This map is Number 37 of 100 maps in the atlas and is entitled " The Road from London to Carlisle." From Darleston to Newcastle to Brewerton to Grutam to Warrington to Newton to Wigan to Whittle to Preston to Garstang to Carlisle. More Info This antique strip map is from the "Britannia" by John Ogilby, first published in 1675 with later hand colouring . This map is Number 37 of 100 maps in the atlas and is entitled " From Darleston to Newcastle to Brewerton to Gridham to Warington to Newton to Wigan to Whittle to Preston to Garstang to Carlisle." This antique strip map is from the "Britannia" by John Ogilby, first published in 1675 with later hand colouring . This map is Number 37 of 100 maps in the atlas and is entitled " From Darleston to Newcastle to Brewerton to Gridham to Warington to Newton to Wigan to Whittle to Preston to Garstang to Carlisle." John Ogilby - The Road from London to Carlisle in com. Cumberland. More Info This antique strip map is from the "Britannia" by John Ogilby, first published in 1675 with later hand colouring . This map is Number 37 of 100 maps in the atlas and is entitled " The Road from London to Carlisle in com. Cumberland." From Darleston to Newcastle to Grulam to Warington to Newton to Wigan to Whittle to Preston to Garstang to Carlisle. Clean map with good margins. This antique strip map is from the "Britannia" by John Ogilby, first published in 1675 with later hand colouring . This map is Number 37 of 100 maps in the atlas and is entitled " The Road from London to Carlisle in com. Cumberland." From Darleston to Newcastle to Grulam to Warington to Newton to Wigan to Whittle to Preston to Garstang to Carlisle. Clean map with good margins. John Ogilby - The Continuation of the Road from London to St. David's. More Info This antique strip map is from the "Britannia" by John Ogilby, first published in 1675 with later hand colouring . This map is Number 25 of 100 maps in the atlas and is entitled " The Continuation of the Road from London to St. David's." From Abingdon to Faringdon to Lechlade to Fairford to Barnsley to Glocester to Michaeldene Monmouth. Clean map, good margins but browning on the edges. One rust mark which has formed a minute hole near the top of the extrenme right panel.. This antique strip map is from the "Britannia" by John Ogilby, first published in 1675 with later hand colouring . This map is Number 25 of 100 maps in the atlas and is entitled " The Continuation of the Road from London to St. David's." From Abingdon to Faringdon to Lechlade to Fairford to Barnsley to Glocester to Michaeldene Monmouth. Clean map, good margins but browning on the edges. One rust mark which has formed a minute hole near the top of the extrenme right panel..
John Ogilby - The Road from St. David's Com. Pembroke to Holywell Com. Flint. More Info This antique strip map is from the "Britannia" by John Ogilby, first published in 1675 with later hand colouring . This map is Number 66 of 100 maps in the atlas and is entitled "The Road from St. David's Com. Pembroke to Holywell Com. Flint." From St. David's to Fiscard to Newport to Cardigan to Llanarch to Llanbader Vawr near Aberistwith to Talabont to Holywell by Bala & Ruthin. Some light foxing in top margin. This antique strip map is from the "Britannia" by John Ogilby, first published in 1675 with later hand colouring . This map is Number 66 of 100 maps in the atlas and is entitled "The Road from St. David's Com. Pembroke to Holywell Com. Flint." From St. David's to Fiscard to Newport to Cardigan to Llanarch to Llanbader Vawr near Aberistwith to Talabont to Holywell by Bala & Ruthin. Some light foxing in top margin. John Ogilby - The Continuation of ye Extended Road from Barnstable to Truro. More Info This antique strip map is from the "Britannia" by John Ogilby, first published in 1675 with later hand colouring . This map is Number 34 of 100 maps in the atlas and is entitled "The Continuation of ye Extended Road from Barnstable to Truro." From Hatherley to Ivy to Newport to Hall Drunkard to Cambleford to St. Indullion to Padstow to St. Colom to St. Michaell to Truro. Nice clean condition with good margins. This antique strip map is from the "Britannia" by John Ogilby, first published in 1675 with later hand colouring . This map is Number 34 of 100 maps in the atlas and is entitled "The Continuation of ye Extended Road from Barnstable to Truro." From Hatherley to Ivy to Newport to Hall Drunkard to Cambleford to St. Indullion to Padstow to St. Colom to St. Michaell to Truro. Nice clean condition with good margins. More Info This antique strip map is from the "Britannia" by John Ogilby, first published in 1675 . This map is Number 9 of 100 maps in the atlas and is entitled "The Continuation of the Road from London to Barwick". From Chester in ye Street to Newcastle to Morpeth to Alnwick to Betford to Barwick. Uncoloured as published with margins as shown. 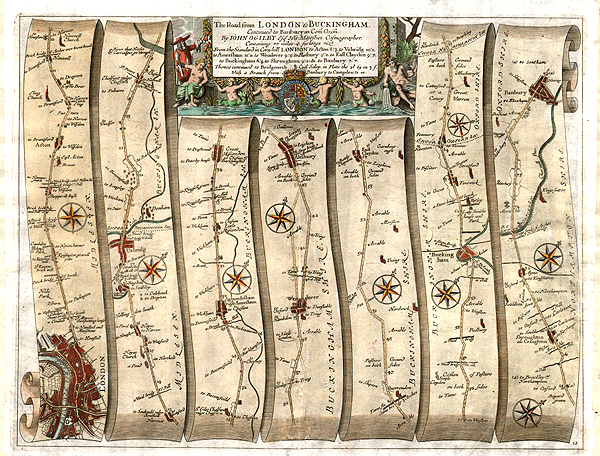 This antique strip map is from the "Britannia" by John Ogilby, first published in 1675 . This map is Number 9 of 100 maps in the atlas and is entitled "The Continuation of the Road from London to Barwick". From Chester in ye Street to Newcastle to Morpeth to Alnwick to Betford to Barwick. Uncoloured as published with margins as shown. More Info This antique strip map is from the "Britannia" by John Ogilby, first published in 1675. This map is Number 7 of 100 maps in the atlas and is entitled "The Continuation of the Road from London to Barwick beginning at Tuxford & Extending to York." FromTuxford to Bawtree to Doncaster to Wentbridge to Tadcaster to York. Uncoloured as published with good margins. 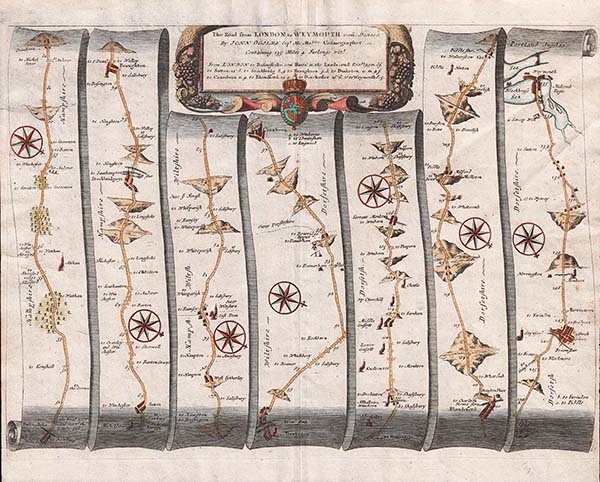 This antique strip map is from the "Britannia" by John Ogilby, first published in 1675. This map is Number 7 of 100 maps in the atlas and is entitled "The Continuation of the Road from London to Barwick beginning at Tuxford & Extending to York." FromTuxford to Bawtree to Doncaster to Wentbridge to Tadcaster to York. Uncoloured as published with good margins. John Ogilby - The Extended Road from Oakham to Richmond in Yourkshire. More Info This antique strip map is from the "Britannia" by John Ogilby, first published in 1675. This map is Number 48 of 100 maps in the atlas and is entitled "The Extended Road from Oakham to Richmond in Yourkshire". From Oakham to Milton Mowbray to Plumtree to Nottingham to Papplewick to Mansfield to Clown to Aughton to Rotherum to Wombwell to Barnsley. Uncoloured as published with good margins. 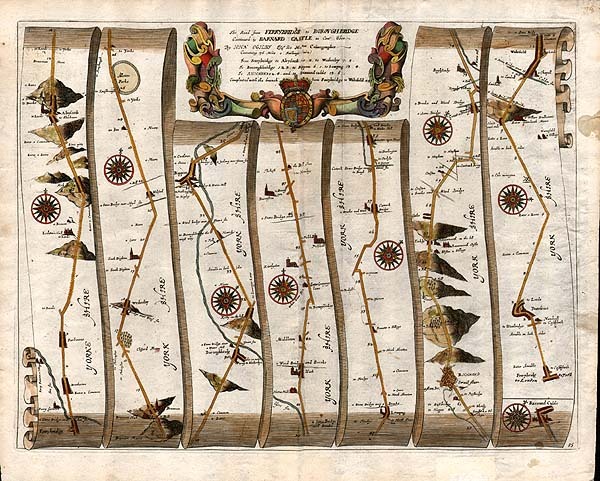 This antique strip map is from the "Britannia" by John Ogilby, first published in 1675. This map is Number 48 of 100 maps in the atlas and is entitled "The Extended Road from Oakham to Richmond in Yourkshire". From Oakham to Milton Mowbray to Plumtree to Nottingham to Papplewick to Mansfield to Clown to Aughton to Rotherum to Wombwell to Barnsley. Uncoloured as published with good margins. More Info This antique strip map is from the "Britannia" by John Ogilby, first published in 1675 with later hand colouring . This map is one of 100 maps in the atlas and is entitled " The Road from London to Weymouth." From Basingstoke to Sutton to Stockbridge to Broughton to Dunketon to Cramborn to Blandford to Dorchester to Weymouth. Clean map with good margins. This antique strip map is from the "Britannia" by John Ogilby, first published in 1675 with later hand colouring . This map is one of 100 maps in the atlas and is entitled " The Road from London to Weymouth." From Basingstoke to Sutton to Stockbridge to Broughton to Dunketon to Cramborn to Blandford to Dorchester to Weymouth. Clean map with good margins. John Ogilby - The Road from London to Arundel. Com. Sussex. More Info This antique strip map is from the "Britannia" by John Ogilby, first published in 1675 with later hand colouring . This map is Number 4 of 100 maps in the atlas and is entitled "The Road from London to Arundel. Com. Sussex. From Cornhill to Ewel to Letherhead to Mickleham to Dorking to Billinghurst to Amberley to Houghton to Arundel. Narrow margins as shown. This antique strip map is from the "Britannia" by John Ogilby, first published in 1675 with later hand colouring . This map is Number 4 of 100 maps in the atlas and is entitled "The Road from London to Arundel. Com. Sussex. From Cornhill to Ewel to Letherhead to Mickleham to Dorking to Billinghurst to Amberley to Houghton to Arundel. Narrow margins as shown. John Ogilby - The Road from Shrewsbury to Chester to Holywell Com. Flint. More Info This antique strip map is from the "Britannia" by John Ogilby, first published in 1675 with later hand colouring . This map is Number 98 of 100 maps in the atlas and is entitled "The Road from Shrewsbury to Chester to Holywell Com. Flint.. From Shrewsbury to Elesmere to Wrexham to Mould to Holywell. This antique strip map is from the "Britannia" by John Ogilby, first published in 1675 with later hand colouring . This map is Number 98 of 100 maps in the atlas and is entitled "The Road from Shrewsbury to Chester to Holywell Com. Flint.. From Shrewsbury to Elesmere to Wrexham to Mould to Holywell. John Ogilby - The Continuation of the Road from London to Carlisle com. Cumbr. More Info This antique strip map is from the "Britannia" by John Ogilby, first published in 1675 with later hand colouring . This map is Number 38 of 100 maps in the atlas and is entitled "The Continuation of the Road from London to Carlisle com. Cumbr. From Garstang to Lancaster to Boulton to Burton to Kendal to Thrumby to Penrith to Heskot to Carlisle. Lower part of both vertical margins have been strengthened. This antique strip map is from the "Britannia" by John Ogilby, first published in 1675 with later hand colouring . This map is Number 38 of 100 maps in the atlas and is entitled "The Continuation of the Road from London to Carlisle com. Cumbr. From Garstang to Lancaster to Boulton to Burton to Kendal to Thrumby to Penrith to Heskot to Carlisle. Lower part of both vertical margins have been strengthened. John Ogilby - The Road from Dartmouth in Com. Devon to Minhead in Com. Somerset. More Info This antique strip map is from the "Britannia" by John Ogilby, first published in 1675 with later hand colouring . This map is Number 65 of 100 maps in the atlas and is entitled "The Road from Dartmouth in Com. Devon to Minhead in Com. Somerset. From Dartmouth to Newton Bushel to Kenford to City of Exeter to Silverton to Teverton to Bampton to Berry to Embercum to Minehead. Narrow margins as shown. This antique strip map is from the "Britannia" by John Ogilby, first published in 1675 with later hand colouring . This map is Number 65 of 100 maps in the atlas and is entitled "The Road from Dartmouth in Com. Devon to Minhead in Com. Somerset. From Dartmouth to Newton Bushel to Kenford to City of Exeter to Silverton to Teverton to Bampton to Berry to Embercum to Minehead. Narrow margins as shown. John Ogilby - The Road from Monmouth to Llanbeder in Cardigansh. More Info This antique strip map is from the "Britannia" by John Ogilby, first published in 1675 with later hand colouring . This map is one of 100 maps in the atlas and is entitled "The Road from Monmouth to Llanbeder in Cardigansh." From Monmouth to Llandilo Cruseny to Abergeveny to Crecowel to Brecknoch to Redbrue to Llanimdofry to Llanbeder. Fine condition with good margins. 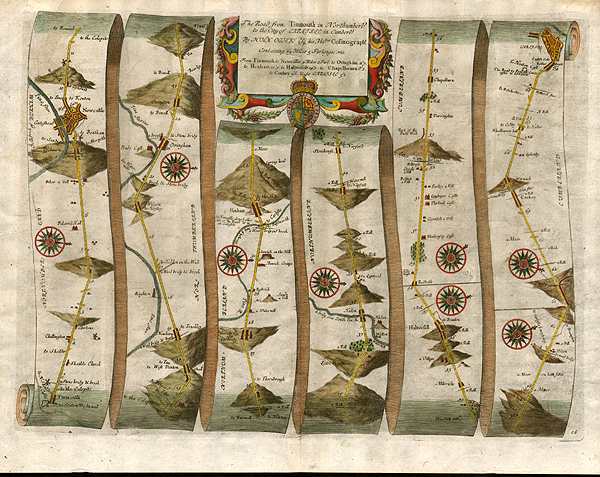 This antique strip map is from the "Britannia" by John Ogilby, first published in 1675 with later hand colouring . This map is one of 100 maps in the atlas and is entitled "The Road from Monmouth to Llanbeder in Cardigansh." From Monmouth to Llandilo Cruseny to Abergeveny to Crecowel to Brecknoch to Redbrue to Llanimdofry to Llanbeder. Fine condition with good margins. John Ogilby - The Road from London to St. Neott's in Com. Hunt, Continued to Oakeham in Com. Rutland. More Info This antique strip map is from the "Britannia" by John Ogilby, first published in 1675 with later hand colouring . This map is Number 45 of 100 maps in the atlas and is entitled "The Road from London to St. Neott's in Com. Hunt, Continued to Oakeham in Com. Rutland. From Cornhill, London to Barnet to Hatfield to Stevenage to Baldock to Biggleswade to Temsford to St. Neott's to Catworth to Lyford to Harringworth to Oakeham. Old split in lower half of centrefold repaired on verso. This antique strip map is from the "Britannia" by John Ogilby, first published in 1675 with later hand colouring . This map is Number 45 of 100 maps in the atlas and is entitled "The Road from London to St. Neott's in Com. Hunt, Continued to Oakeham in Com. Rutland. From Cornhill, London to Barnet to Hatfield to Stevenage to Baldock to Biggleswade to Temsford to St. Neott's to Catworth to Lyford to Harringworth to Oakeham. Old split in lower half of centrefold repaired on verso. John Ogilby - The Road from Prestaine in Com. Radnor to Carmarthen. More Info This antique strip map is from the "Britannia" by John Ogilby, first published in 1675 with later hand colouring . This map is entitled "The Road from Prestaine in Com. Radnor to Carmarthen" Commencing at Prestaine to New Radnor to Llanimdofry to Abermarlis to Rue Raddor to Carmathen." Clean map with good margins. This antique strip map is from the "Britannia" by John Ogilby, first published in 1675 with later hand colouring . This map is entitled "The Road from Prestaine in Com. Radnor to Carmarthen" Commencing at Prestaine to New Radnor to Llanimdofry to Abermarlis to Rue Raddor to Carmathen." Clean map with good margins. John Ogilby - The Road from London to Barnstable in Devonshire. More Info This antique strip map is from the "Britannia" by John Ogilby, first published in 1675 published in 1675 with later hand colouring . This map is entitled "The Road from London to Barnstable in Devonshire" Commencing at Andover to Amesbury to Shruton to Warminster to Maiden Bradley to Bruton to Weston Regis to Ascot to Bridgewater. Clean map with good margins. This antique strip map is from the "Britannia" by John Ogilby, first published in 1675 published in 1675 with later hand colouring . This map is entitled "The Road from London to Barnstable in Devonshire" Commencing at Andover to Amesbury to Shruton to Warminster to Maiden Bradley to Bruton to Weston Regis to Ascot to Bridgewater. Clean map with good margins. John Ogilby - The Road from St. David's to Holywell. More Info This antique strip map is from the "Britannia" by John Ogilby, first published in 1675 with later hand colouring . This map is Number 66 of 100 maps in the atlas and is entitled " The Road from St. David's to Holywell." From St. David's to Fisgard to Newport to Cardigan to Llanarch to Llanbader Vaur to Aberystwith to Talybont thence to Holywell by Bala and Ruthiin. This antique strip map is from the "Britannia" by John Ogilby, first published in 1675 with later hand colouring . This map is Number 66 of 100 maps in the atlas and is entitled " The Road from St. David's to Holywell." From St. David's to Fisgard to Newport to Cardigan to Llanarch to Llanbader Vaur to Aberystwith to Talybont thence to Holywell by Bala and Ruthiin. John Ogilby - The Continuation of the Road from St. Davids to Holywell. More Info This antique strip map is from the "Britannia" by John Ogilby, first published in 1675 with later hand colouring . This map is Number 67 of 100 maps in the atlas and is entitled " The Continuation of the road from St. Davids to Hollywell." From Talabont to Machenlleth to Aberangel to Llanum-Mowthy to Bala to Bettus to Ruthyn to Holywell. This antique strip map is from the "Britannia" by John Ogilby, first published in 1675 with later hand colouring . This map is Number 67 of 100 maps in the atlas and is entitled " The Continuation of the road from St. Davids to Hollywell." From Talabont to Machenlleth to Aberangel to Llanum-Mowthy to Bala to Bettus to Ruthyn to Holywell. More Info This antique strip map is from the "Britannia" by John Ogilby, first published in 1675 with later hand colouring . 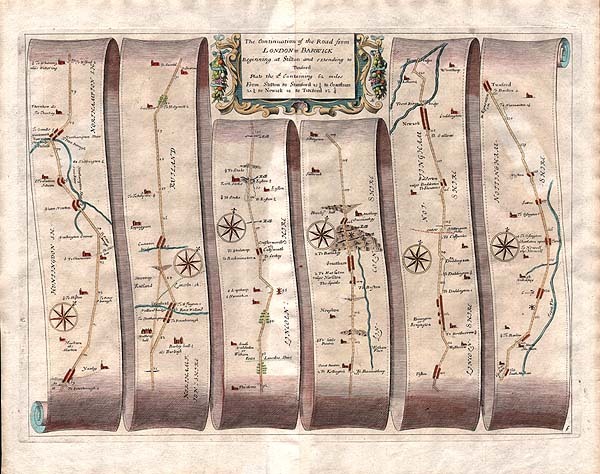 This map is Number 6 of 100 maps in the atlas and is entitled " The Continuation of the Road from London to Barwick"
This antique strip map is from the "Britannia" by John Ogilby, first published in 1675 with later hand colouring . This map is Number 6 of 100 maps in the atlas and is entitled " The Continuation of the Road from London to Barwick"
John Ogilby - The Continuation of the Road from London to Carlisle. More Info This antique strip map is from the "Britannia" by John Ogilby, first published in 1675 with later hand colouring . This map is Number 38 of 100 maps in the atlas and is entitled "The Continuation of the Road from London to Carlisle." Commencing at Garstang to Lancaster to Boulton to Burton to Kendal to Thrumby to Penrith to Helkot to Carlisle. Overall age toned. This antique strip map is from the "Britannia" by John Ogilby, first published in 1675 with later hand colouring . This map is Number 38 of 100 maps in the atlas and is entitled "The Continuation of the Road from London to Carlisle." Commencing at Garstang to Lancaster to Boulton to Burton to Kendal to Thrumby to Penrith to Helkot to Carlisle. Overall age toned. John Ogilby - The Road from Nottingham to Grimsby in the County of Lincolne. More Info This antique strip map is from the "Britannia" by John Ogilby, first published in 1675 with later hand colouring . This map is Number 78 of 100 maps in the atlas and is entitled "The Road from Nottingham to Grimsby in the County of Lincolne." Commencing at Nottingham to Newark to Lincolne to Wilton to Markit Raisin to Stanton to Briggesley to Grimsby. This antique strip map is from the "Britannia" by John Ogilby, first published in 1675 with later hand colouring . This map is Number 78 of 100 maps in the atlas and is entitled "The Road from Nottingham to Grimsby in the County of Lincolne." Commencing at Nottingham to Newark to Lincolne to Wilton to Markit Raisin to Stanton to Briggesley to Grimsby. John Ogilby - The Continuation of ye Road from London to Barnstable. More Info This antique strip map is from the "Britannia" by John Ogilby, first published in 1675 with later hand colouring . This map is entitled "The Continuation of ye Road from London to Barnstable." Commencing at Bridgewater to Dulverton to South Molton to Barnstable to Torrington to Hatherley. Clean map. This antique strip map is from the "Britannia" by John Ogilby, first published in 1675 with later hand colouring . This map is entitled "The Continuation of ye Road from London to Barnstable." Commencing at Bridgewater to Dulverton to South Molton to Barnstable to Torrington to Hatherley. Clean map. John Ogilby - The Road from London to Buckingham continued to Banbury. More Info This antique strip map is from the "Britannia" by John Ogilby, first published in 1675 with later hand colouring . It is entitled "The Road from London to Buckingham continued to Banbury." Commencing at the Standard in Cornhill, London to Acton to Uxbridge to Amersham to Wendover to Alesbury to East Clayton to Buckingham to Shroughton to Banbury. Clean map. Both vertical margins have been strengthened and extended. Old repair to worm tracts either side of cenrefold at the bottom. This antique strip map is from the "Britannia" by John Ogilby, first published in 1675 with later hand colouring . It is entitled "The Road from London to Buckingham continued to Banbury." Commencing at the Standard in Cornhill, London to Acton to Uxbridge to Amersham to Wendover to Alesbury to East Clayton to Buckingham to Shroughton to Banbury. Clean map. Both vertical margins have been strengthened and extended. Old repair to worm tracts either side of cenrefold at the bottom. John Ogilby - The Continuation of the Road from London to Bristol. More Info This antique strip map is from the "Britannia" by John Ogilby, first published in 1675 with later hand colouring . It is entitled "The Continuation of the Road from London to Bristol." Commencing at Marlborough to Caln to Chippenham to Marshfield to Bristol then onward from Bristol to Langford to Axbridge to Huntspil. Clean map with good margins. This antique strip map is from the "Britannia" by John Ogilby, first published in 1675 with later hand colouring . It is entitled "The Continuation of the Road from London to Bristol." Commencing at Marlborough to Caln to Chippenham to Marshfield to Bristol then onward from Bristol to Langford to Axbridge to Huntspil. Clean map with good margins. John Ogilby - The Road from the City of Salisbury, Wilts to Campden, Gloc. More Info This antique strip map is from the "Britannia" by John Ogilby, first published in 1675 with later hand colouring . It is entitled " The Road from the City of Salisbury, Wilts to Campden, Gloc." From Salisbury to Everley to Burbich to Marlborough to Hiworth to Lechlade to Burford to Campden. This antique strip map is from the "Britannia" by John Ogilby, first published in 1675 with later hand colouring . It is entitled " The Road from the City of Salisbury, Wilts to Campden, Gloc." From Salisbury to Everley to Burbich to Marlborough to Hiworth to Lechlade to Burford to Campden. John Ogilby - The Road from London to Kingslyn. More Info This antique strip map is from the "Britannia" by John Ogilby, first published in 1675 with later hand colouring . It is entitled " The Road from London to Kingslyn. From Puckeridge to Barkway to Cambridge to Ely to Littleport to Southery to Downham to Seechy to KingsLyn. This antique strip map is from the "Britannia" by John Ogilby, first published in 1675 with later hand colouring . It is entitled " The Road from London to Kingslyn. From Puckeridge to Barkway to Cambridge to Ely to Littleport to Southery to Downham to Seechy to KingsLyn. John Ogilby - The Road from Oxford to Salisbury continuing to Pool Dorset. More Info This antique strip map is from the "Britannia" by John Ogilby, first published in 1675 with later hand colouring . This map is Number 83 of 100 maps in the atlas and is entitled " The Road from Bristol to Worcester. From City of Oxford to Abington to Shelford to Hungerford to North Tudworth to City of Salisbury thence to Cranborn to Winborne to Pool. This antique strip map is from the "Britannia" by John Ogilby, first published in 1675 with later hand colouring . This map is Number 83 of 100 maps in the atlas and is entitled " The Road from Bristol to Worcester. From City of Oxford to Abington to Shelford to Hungerford to North Tudworth to City of Salisbury thence to Cranborn to Winborne to Pool. John Ogilby - The Continuation of the road from St. Davids to Hollywell. John Ogilby - Carmarthen to Aberystwith. More Info This antique strip map is from the "Britannia" by John Ogilby, first published in 1675 with later hand colouring . This map is one of 100 maps in the atlas and features the road from Carmarthen to Cardigan to Llanbedr to Aberystwyth. This antique strip map is from the "Britannia" by John Ogilby, first published in 1675 with later hand colouring . This map is one of 100 maps in the atlas and features the road from Carmarthen to Cardigan to Llanbedr to Aberystwyth. John Ogilby - The Roads from Shrewsbury and Chester to Holywell, Flint. More Info This antique strip map is from the "Britannia" by John Ogilby, first published in 1675 with later hand colouring . This map is Number 98 of 100 maps in the atlas and is entitled " The Road from Shrewsbury and Chester to Holywell, Flint. From Shrewsbury to Ellesmere to Wrexham to Mould to Holywell. The second from Chester to Flint to Holywell. This antique strip map is from the "Britannia" by John Ogilby, first published in 1675 with later hand colouring . This map is Number 98 of 100 maps in the atlas and is entitled " The Road from Shrewsbury and Chester to Holywell, Flint. From Shrewsbury to Ellesmere to Wrexham to Mould to Holywell. The second from Chester to Flint to Holywell. More Info This antique strip map is from the "Britannia" by John Ogilby, first published in 1675 with later hand colouring . This map is Number 22 of 100 maps in the atlas and is entitled " The Continuation of the Road from London to Bristol" From Marlborough to Caln to Chippenham to Marshfield to Bristol then to Huntspil in Somerset. This antique strip map is from the "Britannia" by John Ogilby, first published in 1675 with later hand colouring . This map is Number 22 of 100 maps in the atlas and is entitled " The Continuation of the Road from London to Bristol" From Marlborough to Caln to Chippenham to Marshfield to Bristol then to Huntspil in Somerset. John Ogilby - The Road from London to Montgomery. More Info This antique strip map is from the "Britannia" by John Ogilby, first published in 1675 with later hand colouring . This map is Number 44 of 100 maps in the atlas and is entitled " The Road from London to Montgomery." From Campden to Evesholme to Worcester to Hundred House to Tenbury to Ludlow to Bishops Castle to Montgomery. This antique strip map is from the "Britannia" by John Ogilby, first published in 1675 with later hand colouring . This map is Number 44 of 100 maps in the atlas and is entitled " The Road from London to Montgomery." From Campden to Evesholme to Worcester to Hundred House to Tenbury to Ludlow to Bishops Castle to Montgomery. More Info This antique strip map is from the "Britannia" by John Ogilby, first published in 1675 with later hand colouring . This map is Number 86 of 100 maps in the atlas and is entitled " The Road from Tinmouth in Northumberland to the City of Carlisle in Cumberland." From Tinmouth to Newcastle to Ovingham to Hexham to Haltwesell to Chapelbourn to Corbey to Carlisle." This antique strip map is from the "Britannia" by John Ogilby, first published in 1675 with later hand colouring . This map is Number 86 of 100 maps in the atlas and is entitled " The Road from Tinmouth in Northumberland to the City of Carlisle in Cumberland." From Tinmouth to Newcastle to Ovingham to Hexham to Haltwesell to Chapelbourn to Corbey to Carlisle." From Stilton to Stamford to Grantham to Newark to Tuxford. Laid on card. John Ogilby - The Road from Hereford to Leicester. More Info This antique strip map is from the "Britannia" by John Ogilby, first published in 1675 with later hand colouring . This map is Number 72 of 100 maps in the atlas and is entitled " The Road from Hereford to Leicester." From City of Hereford to Fromeshill to Allchurch to Solihull to Meriden to the City of Coventry to Woolvey to Sharnford to Leicester. This antique strip map is from the "Britannia" by John Ogilby, first published in 1675 with later hand colouring . This map is Number 72 of 100 maps in the atlas and is entitled " The Road from Hereford to Leicester." From City of Hereford to Fromeshill to Allchurch to Solihull to Meriden to the City of Coventry to Woolvey to Sharnford to Leicester. John Ogilby - The Road from Chelmsford in Essex to Maldon and Raleigh in Essex and to Gravewsend in Kent. More Info This antique strip map is from the "Britannia" by John Ogilby, first published in 1675 with later hand colouring . This map is Number 75 of 100 maps in the atlas.and is entitled " John Ogilby - The Road from Chelmsford in Essex to Maldon and Raleigh in Essex and to Gravewsend in Kent." From Chelmsford to Billericay to Gravesend." 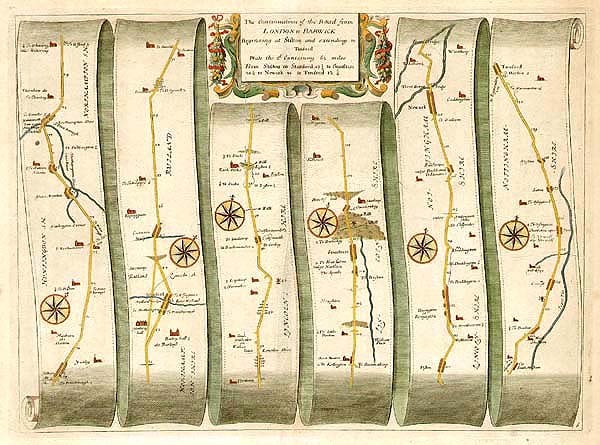 This antique strip map is from the "Britannia" by John Ogilby, first published in 1675 with later hand colouring . This map is Number 75 of 100 maps in the atlas.and is entitled " John Ogilby - The Road from Chelmsford in Essex to Maldon and Raleigh in Essex and to Gravewsend in Kent." From Chelmsford to Billericay to Gravesend."